Watch our video to learn more about our projects and find out about the ways you can get involved. You can make a lasting and positive difference by sponsoring a child. Everyone at CHW is a volunteer. You can join us too, and make a difference to the lives of the children we help! 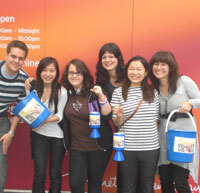 Some of the organisations we support abroad run their own volunteer schemes. We can put you in contact with them, if you want to volunteer overseas. The staff of the children’s organisations we support send us appeals and we then fundraise for their projects. This photo shows the construction of a classroom in Ghana that we raised the money for. You can make a difference by contributing to one of our projects. See our current appeals section for more information about the projects we are fundraising for right now. Children’s Helpers Worldwide (CHW) is a small organisation based in London. We are aiming to create a network for people around the world who want to help give children a better start to life. We work with the staff of local organisations, and have formed partnerships with people running projects in Argentina, China, Ghana, Romania and South Africa, so far. The local projects are very varied, and we work with schools, orphanages, hospitals, medical projects, sports programmes and more. We have supporters and volunteers from different countries around the world and look forward to more people getting involved. To see more about our work, and about getting involved, you can watch our video and song here. Supporting Education and Training in Cape Town, Little by Little! 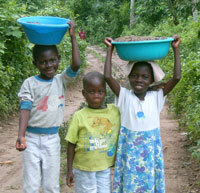 Make double the difference for schoolchildren in Ghana, on the World Day of Social Justice! Can you make a difference for schoolchildren in Ghana?